Genuine teachers are fellow voyagers – they teach you how to face Life! When you don’t know what to do, when you feel the most vulnerable, do what gives you inner peace – as long as it won’t hold you hostage in the long run. When you go through crisis in Life, or when you start searching for meaning in Life, often times people or practices or movements or communities will come your way. They may have always been there – but it is only through being in a crisis that you may notice them! Just being with such people will give you immense inner peace in the face of all the chaos and turmoil around you. In fact all the anxiety and suffering within you will subside in their presence. And you will want to explore that path, the one that’s helping you anchor within, more. But people around you will warn you that such influences are ‘evil’; they will say that you have lost it or that you will be cheated or that you are headed in the wrong direction. 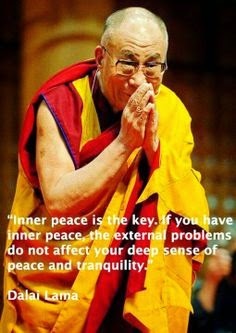 Employ a simple rule of thumb: if you are finding greater inner peace in doing what you are doing, simply do it! I am not championing escapism – through drinking alcohol or doing drugs. I am suggesting exercising a mature, aware choice that helps you gain inner peace. It is normally through a crisis, or from a sense of listlessness, that the search for the meaning of, and for meaning in, Life begins. This search may lead you to places of worship, to the scriptures, to spiritual Gurus, to a deep study of religion, to practices such as transcendental meditation or yoga, to communities like ISKCON (International Society for Krishna Consciousness) or to self-help groups that use the scriptures or psychology-based methods and practices for healing and anchoring within. Normally, you end up trying several of these and then choose the one that works for you. And it is not necessary that your choice, your path, may the one chosen for someone else in your same situation. For instance, I know some who became a Buddhist when she wanted to get over her mid-Life career crisis and then decided she needed “no religion” to live her Life. Someone else, a Hindu, in the same situation, found great value in the teachings of Jesus Christ and embraced Christianity. Another person we know, who has a special child, is a devout follower of Swami Sathya Sai Baba. While someone else follows the teachings of Jaggi Vasudev. Each of us has a unique way of making sense of Life. And each person encounters and chooses as catalyst that someone or religion or practice that supports his or her journey the best. Yes the world is full of people who take people for a ride and try to capitalize on their vulnerability. But not all Gurus are crooks and no religion is flawed – just the way religion is practised today is questionable! But I believe I am blessed. Because I have met only the most wonderful people in Life. Their experiences and their wisdom have contributed to my evolution in no small measure. I have understood that all the scriptures, all the religions, all the teachers and all the Gurus champion the same lesson – Live in the moment and live Life to the fullest! They may speak different languages, they may show different approaches, but the message is the same. So, there really is no problem if you use religion or if you follow a Guru to arrive at that awakening, to learn to live Life without worry and simply be! The problem arises when you expect others to solve your problems! This is where you get waylaid. This is where the charlatans thrive and operate. This is how your vulnerability is leveraged. No one can solve another’s problems. Every problem, every crisis, every grief, every event of pain and loss has to be faced and gone through in Life. Genuine teachers are fellow voyagers – just like you and me. They have no magical powers. They will not tell you that they can solve your problems. They will only teach you how to deal with a problem. They will help you evolve and mature into a stronger person. In their company, from their teachings, through their grace, you will learn the value of letting go, the power of acceptance and the meaning of just being. Whoever you choose to guide you, lead you, follow them or embrace such a practice only if it helps you anchor within, with inner peace. Because only when you are peaceful within that you can deal with the chaos and crisis outside! Author AVIS ViswanathanPosted on June 24, 2014 March 14, 2016 Categories Art of Living, Buddhism, Christianity, Crisis, Grief, Guru, http://schemas.google.com/blogger/2008/kind#post, Inner Peace, Intelligent Living, ISKCON, Jaggi Vasudev, Jesus Christ, Loss, Pain, Suffering, Swami Sathya Sai BabaLeave a comment on Genuine teachers are fellow voyagers – they teach you how to face Life!